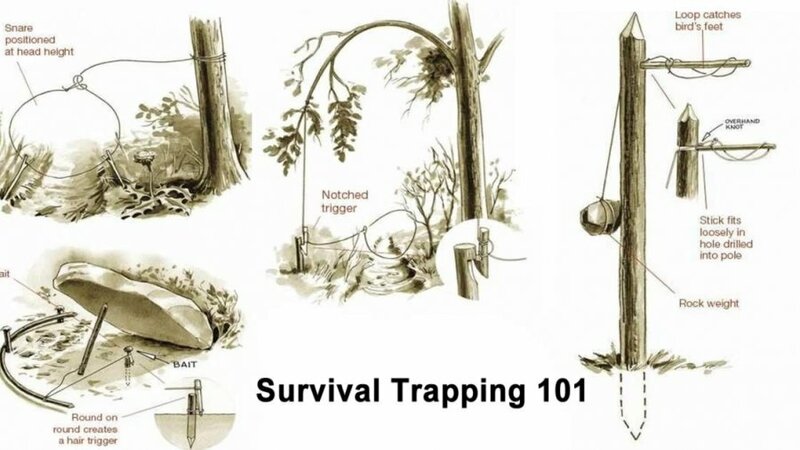 The point of survival trapping is to supply food, specifically meat. Success in trapping means catching enough game to at least supplement the diet. However, catching the meat isn’t the end of the story. It also means handling and preparing the meat so that nobody gets sick and the resulting food is edible. This is an aspect of survival trapping that often doesn’t get enough attention. Even people who like to hunt often find field dressing animals to be necessary but unpleasant. Making decisions about cuts of meat, cooking processes and the overriding business of making sure the meat is safe to eat might not seem like survival issues – but they are. You can be just as dead from food poisoning as you can from radiation. Besides, if it’s a survival situation for a long-term, preparation and cooking of food is a constant issue. It’s one main reason for survival trapping – providing a variety of meat. Knowing how to dress, prepare and cook the meat is part of the necessary survival skills. This is obvious to most people: any animal killed for eating should be gutted and drained of blood as soon as possible, usually within few hours. This is just as true for small game taken in traps as it is for big game like deer or elk. Much depends on the air temperature, as hot and humid summer days will promote the spread of bacteria a lot quicker than a winter snowdrift. The need for timely field dressing to avoid the spread of toxic bacteria and slow down decomposition, means that meat safety and preparation are as important for survival trapping as the trapping techniques. Bacteria – all animals carry a heavy load of bacteria, trillions of bacteria concentrated in places such as the intestinal tract (especially the colon), the kidneys and bladder, the sinuses, and genital regions. Most of the time this bacterial flora is in balance, but when the animal dies, the balance is lost and the bacteria proliferate – creating more bacteria and with them toxins that begin to break down the cells of the body. That’s why bodies decompose. Not all of these toxins are harmful to people, but many are such as salmonella and E. coli, especially in high concentration. The longer a carcass goes without removing the blood and internal organs, the more likely the spread of bacteria and toxin. It’s a chore to clean what you trap, but it has to be done as soon and efficiently as possible. Most animals should be field dressed within an hour or two to preserve freshness (if not done immediately). Diseased animals – While avoiding the spread of bacteria during field dressing and storing a carcass so it doesn’t deteriorate are evident; the risk of eating a diseased animal is not always obvious. Fortunately, diseased animals aren’t that common, but as they say, it only takes once. Animals get illnesses. Many of the diseases are species specific and are not transferrable to humans. Some are transferrable. Other animal diseases increase the amount of bacteria in the animal, which increases the risk of eating them. Either way, the sound advice is, if you have a diseased animal don’t eat it. The problem, of course, is knowing when an animal is seriously diseased. Animals with obvious skin or fur problems, that have odd movements or behavior, or that show physical signs of ill health (like foaming at the mouth) are obviously suspicious. When you open them up, inspecting the liver should be routine – look for discoloration, nodules, spots, lesions or anything that indicates an unhealthy liver, which is one of the first places that illness shows up in the major organs. While thorough cooking might neutralize disease pathogens, there’s no guarantees; the safe, if sometimes difficult decision, is to not eat suspicious food. Experienced people can field dress most small animals such as squirrel or rabbit in about five minutes or less. Note the word “experienced.” If you’re in a survival situation and learning how to prepare trapped animals for the first time, it can be done; but the results won’t be pretty and it could be risky by unknowingly spreading bacteria. Sharp knife, for small game this means something very easy to handle, very sharp and not very big – not much bigger than a paring knife. This may or may not fit the description of a standard survival knife. You’ve certainly heard the expression, “There’s more than one way to skin a cat.” This goes for every animal, and if you ask ten hunters or butchers how to prepare something, you’ll probably get eleven answers (or more). They don’t all have the “best” way to field dress a particular animal; but whatever they do, it probably works and you can copy it – until you learn a better way. When picking up a field dressing technique, be sure you understand the difference between field dressing to preserve the skin (as in trapping for fur) and field dressing for eating. For some animals, the difference can be significant. Here some things to consider, which is hardly comprehensive, but illustrate that preparing what you trap for eating requires knowledge. Gutting – Two things about cutting the guts out of any animal: 1. It doesn’t always come first and 2. Avoid cutting open the colon or bladder – or face releasing potentially harmful bacteria into the abdominal cavity. Both of these points highlight that species knowledge is important (where is the bladder in a rabbit?) and somewhere along the line, you need to see, observe or read about a proper way of field dressing a particular animal, and then practice it. Be sure to safely dispose of the unwanted offal, especially intestines. This usually means bury it to avoid attracting predators. Skinning – It’s not that easy to skin small animals without making a mess of the underlying tissue and structure, especially since most techniques involve using considerable force to pull skin off a carcass. While usually the skin or pelt of most animals will readily separate from the underlying tissue, some animals are more difficult than others. Squirrels, for example, are small enough and tough enough to need a lot of force to skin; some techniques involve clamping the hide with a foot. Squirrels are also much easier to skin while the body is still warm, within about fifteen minutes of killing. This isn’t what most hunters want to do, but for this species, it makes the job much easier. Storage – Depending on the air temperature, fully dressed animals need to be air or cloth dried, allowed to cool down (if that doesn’t happen while dressing) and then stored in something will protect the meat from contamination. If possible, the storage should be cool (under 40 degrees Fahrenheit) and dry. If not, then the rate of bacterial spread will increase. Most wild game should be cooked or preserved within a day of killing and dressing. In a survival situation, you are probably not expecting gourmet eating experiences. However, it’s probably also true that at least occasionally having food that goes beyond “edible” is positive for morale. When preparing and cooking game, the first concern is with food safety, but making it edible – or even delicious – has its place. There’s also the matter of preserving the meat for future use. Cooking will usually add a few days of preservation (assuming reasonably cool storage temperatures), but longer- term meat preservation means specialized methods such as smoking, dehydrating or salting. Meat cuts – While it may be an unnecessary bit of sophistication, it helps to understand that not all portions of an animal are of the same flavor or tenderness. We know this from beef, where the difference between a tenderloin and muscular shoulder meat is obvious. The same general condition also applies to small animals, where leg and tendon meat will be tough but the loin from next to the spine will be tender. You can roast the loin over a fire and expect it to be soft and juicy. If you do the same thing with leg meat, you can chew on it through the night. There is also the issue of eating animal organs – heart, brains, kidneys, liver. In a true survival situation, it shouldn’t matter, everything edible should be eaten. However, habitual and cultural aversion to eating organs can be a powerful deterrent. Aging – A century or two ago, most game was “aged” before eating. That meant field dressing and then storing the carcass until it began to rot, which could take anywhere from a few hours to many days. The process, known as mortification made the meat tender and ‘gamy,’ that strong animal flavor, which back then was desirable. These days, with our reliance on fresh meat, it’s not so popular. For the most part, aging an animal carcass is a matter of preference, but keep in mind that in survival situations, dressed meat that is on the verge of rotting is still edible. Brining or marinating – Soaking in saltwater for a few hours enhances most meat, but of course, you need enough water and salt. Most bugout cooking kits have some salt, but usually not enough for regular brining. This is even truer of marinating, which requires some kind of spiced sauce, not a staple of bugout food lists. Both brining and marinating can prolong the storage of fresh meat by a few days. Spicing – Either before or after cooking, spicing can make a big difference in the palatability of meat. Salt and pepper are obvious, but many bugout kits have other spice types (garlic powder, onion powder, Italian spices among many). Any of these can help vary the taste of meat or mask undesirable flavors. Cooking – Like knowing which cuts of meat are tender and which are not, cooking is a matter of choosing a method, such as fire roasting or boiling, which will make the best of the meat. Access to a stove means almost any type of cooking is possible, although in a survival situation this is a luxury. Of course, there many books about cooking wild game, none of which are likely to be carried or appropriate for a survival situation. However, it might not hurt to be familiar, in general, with the some of the recipes or methods of preparation. Smoking – An ancient and wonderful method is to preserve meat it by smoking. The concept is simple; allow smoke to permeate the meat for many hours without actually cooking the meat. In practice, and especially under survival conditions, this may not be practical, as smoking usually requires the means to enclose the meat (some kind of smoking box) with many hours of tending fire and checking on the progress.